Sitting in one position for far too long? 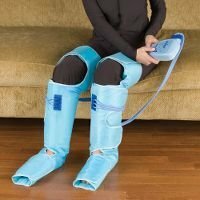 You’d best get up from time to time to get the blood circulating in the lower part of your body, but for those who can’t afford the luxury of doing that due to never-ending datelines, there is always the Circulation Improving Leg Wraps. These leg wraps inflate and deflate to improve circulation, soothe sore muscles, and reduce swelling in your lower extremities. Similar to hospital compression boots that stimulate circulation in sedentary patients, the leg wraps have six airbags that wrap around the entire leg and inflate and deflate to help blood vessels expand and contract. The compression intervals stimulate circulation in the thighs, hamstrings, calves, and feet and help facilitate blood flow back to the heart. The corded remote allows you to select from three levels of intensity and choose from seven programs that pinpoint different areas and at varying intervals. Adjustable Velcro closures ensure optimal fit for all sizes. Plugs into AC. Guess only folks in First and Business Class will be able to use this when flying since those cabins come with built-in AC outlets, which is kinda ironic as they have all the legroom in the world. Hopefully more and more airlines will throw in AC outlets into economy class seats in the future. The Circulation Improving Leg Wraps can be purchased for $149.95.